Up super early this morning for me. 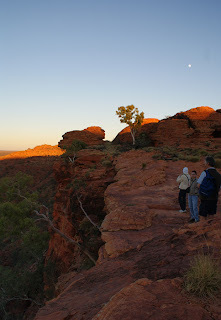 I wanted to do the Rim Walk but we also had a long drive ahead of us to get to Uluru. The walk was listed as taking 3hours so it was going to be a sunrise walk! I was speaking to the people camped next to us and they said they did the walk from 8 til 11 and there were still some parts of the canyon wall that were dark so they wondered if it would be any good for sunrise... but the Kings Tour bus did a tour from 5:30 so i thought there had to be something to see. It was COLD and dark when i left at just after 6am, and i actually dawdled a bit getting out there cos i thought i would be far too early. But Kings had it right! It was absolutely glorious first thing. The climb up the hill to start was a hard slog but the rest of the walk (7.5km in total) was a nice climb with only some steep parts. 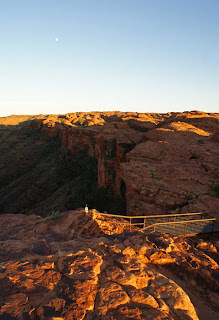 And as the sun rose you could watch as the light slowly lit up the side of the canyon wall. I took a gazillion photos but they really don't do it justice. The colour was incredible and the shape of the rocks was totally unique. 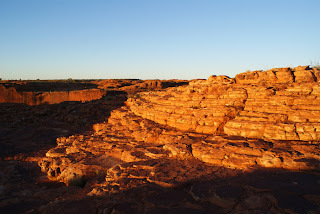 There were areas of sandstone domes that had weathered away to form lots of ball shapes all in a grid together, and ripple marks all over the floor at the top where it used to be a massive inland sea, and sections that looked like a huge ampitheatre with steps all in a semi-circle that looked just like seating. And then down in a gully there was a waterhole all surrounded by ancient cycad palms. 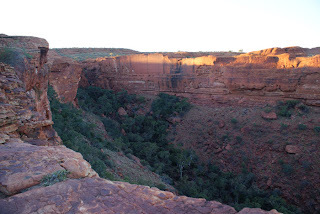 I was really disappointed that Tim and Mum and Dad missed it because i think that without doing the Rim Walk there is not all that much to Kings Canyon. The Riverbed walk is not really worth the massive drive out there to get to it but seeing the canyon from the top, and seeing it at sunrise, was absolutely magic. I made good time (and certainly did not feel like i was rushing) and i finished the walk in 2+half hours so i was back at camp nice and early to get things packed up and get us on the way. We called into Kings Creek Station on the way out cos Tim was keen to try a camel burger after a bloke we met on the road raved about them.... but they were sold out!! Bastards! 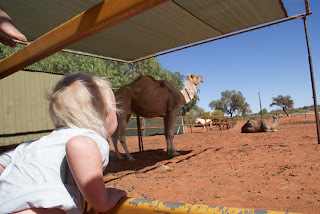 So we looked at the camels (which Darcy kept insisting were 'dogs') and wandered for a bit and then back in the car for the rest of the three+half hour drive to Uluru. Kids travelled like champions and we arrived about 1:30. Set up our camp and off to The Rock. We could see it for quite some distance out so we were keen to get a good look to see if it was "just a rock" or if it did look like something special. We were not disappointed. It really is incredble to see. The surface looks like all one big smooth piece of rock, but not SMOOTH smooth! It's all patina'ed but it's all one piece of sandstone and it looks almost like a shell. Then there are lots of pock marks and holes and caved in bits and actual caves and overhangs and gullies. So not the least bit disappointing to see! 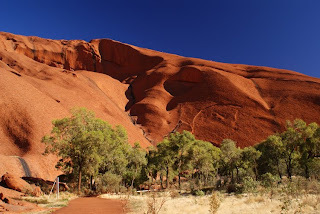 I had decided not to climb it (all the tourist info asks that we not climb it to respect the wishes of the Traditional Owners because it is a sacred place) but Tim, Dad, and Mum all wanted to cos it really is a once in a lifetime sort of thing. 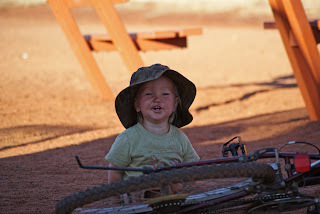 So we loaded the kids in the bike caboose so i could ride around the base while they climbed. Tim is in the yellow shirt, Dad is in the white shirt standing sideways having a chat (when is he not having a chat!?!?). But it was fun to watch the head up the rail so we waited for a bit. And then two minutes into the climb Mum stopped! She'd had enough! It felt like it was straight up and she was not sure she would make it, and coming down looked scary so she did not even make it to the chain railing. So, instead, Mum and i and the boys watched Tim and Dad disappear over the top of the rock and then we went for a bit of a walk around part of the base. 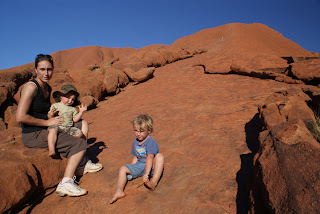 Lots to see and walking around even a small section made you realise how huge Uluru is. Took them just shy of 2hours and it was apparently terrific. This is our first peak of them coming back over the crest. Tim said it was a totally alien experience. The top of the rock was all undulatating and pocked and was like a martian-red landscape with the occasional scragely tree growing out of a crevice. The view was awesome. 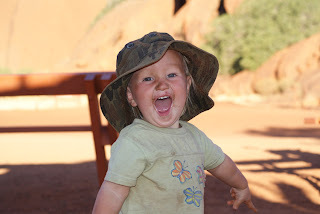 He could see Mt Connor which is something like 100km away. 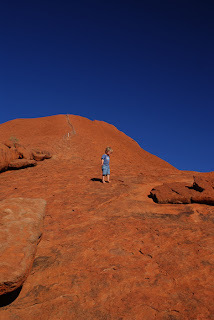 Uluru felt HUGE but everything else around him seemed to stretch on forever. 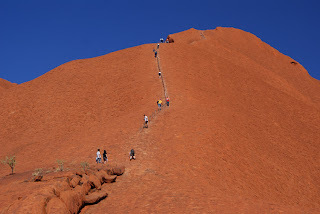 He can't describe why it felt so amazing but even apart from the fact that it was a tough climb and so really rewarding to get to the top, it was also amazing because Uluru is such an icon of Australia and seems almost like a rite of passage. 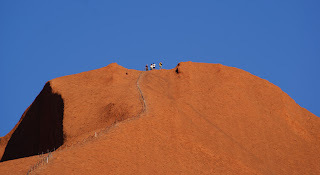 I can totally see the dilemna with people that want to climb Uluru (cos i actually really did want to climb too!) 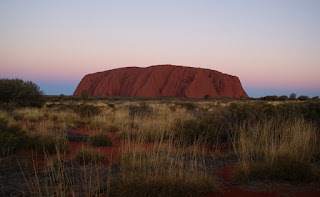 because i know that we really respect the site and respect that it holds such power for the Anangu people and we don't want to compromise that or disrespect their wishes or seem to take for granted the fact that we are allowed access.... but by the same token it is part of our land and our country too. 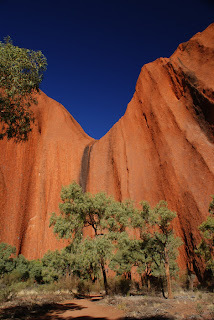 And we heard the stories of their ancestors and hear their law and we know there is soooo much more to Uluru than the climb and did not come JUST to climb but i think that choosing whether or not to climb is such a personal thing. 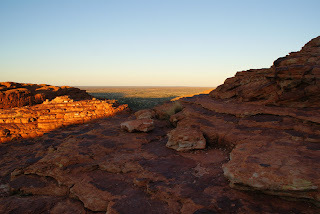 I am glad that i saw the base and saw the sacred women's site along the walk and saw the rock art and the waterhole etc i am also glad that Tim and Dad got to see the top. ??? They were both pretty buggered after their efforts but it was really close to sunset. 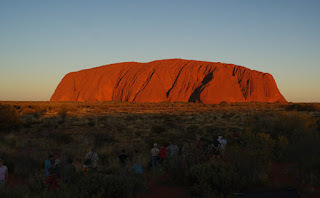 So we headed back to the viewing area and joined the hundreds of others lined along the fence to watch the rock change colour as the sunlight faded. Another great experience! 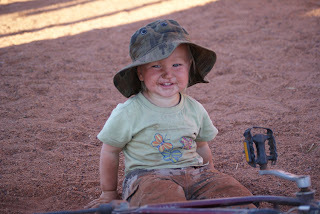 Not surprisingly the kids both fell asleep on the way back to the campground so we had a bit of a messy bedtime trying to sponge them down (they were FILTHY!) and get them back to sleep before a lazy dinner and we both crashed ourselves. Plans for a sunrise viewing were cancelled due to lack of energy!